(marlin, swordfish, and sailfish), put baits or lures well to the side of the boat, where they won't tangle with those baits or lures being trolled from rods on the stern or transom (which are called flat lines when outriggers are used). 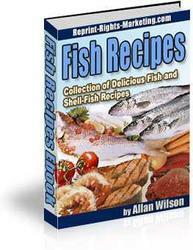 Bottom fishing is just that: fishing baits or lures directly on the ocean floor. The boat is anchored, so that it remains directly over a particular area that should hold fish. Many ocean fishermen use a sonar unit to find a structure, which may be a reef, a boat wreck, rubble, or any object or objects that attracts fish. You'll find many species such as blackfish, sea bass, and porgies around a structure. A boat may also anchor over comparatively open bottoma mussel bed or a raised portion of the ocean floorto fish for other species, such as cod, mackerel, and whiting. Drifting involves a couple of types of fishing. With this method, the unanchored, unpowered boat floats over a likely area, driven by the wind, the tide, or a current. In some situations, the boat operator may have the motor running at very light throttle to keep the craft on a particular course. You can fish with bait or lures directly on the bottom, as when flounder fishing, or at mid-levels, for species such as bluefish. 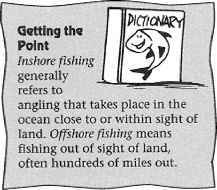 Sometimes drifting is used to find a concentration of fish, in which case the boat is anchored or drifted repeatedly over that spot. Chumming is the use of ground-up bait to attract fish close to the boat, where they are then fished for with lures or bait. Depending on the species and the situation, the boat may be anchored or drifting. You can make chum on the boat by grinding up baitfish into a souplike consistency and ladling it over the side of the boat, so that a chum slick spreads out across the water. Gamefish will scent the slick and follow it to the boat, where anglers will have lures or baited lines out. You can also disperse chum in the water by freezing it solid and letting it melt in a crate tied to the hull. The rocking of the boat lifts the chum block in and out of the water, creating a steady slick. Chumming is used extensively by shark and bluefish anglers. Chunking is very similar to chumming, except that small pieces of bait are tossed out into the chum slick. The difference is that chum is basically liquid in form, with specks of flesh in the suspension that are too small to satisfy the appetite of a large fish. The chum's purpose is simply to attract the fish. When chunking, however, you are actually feeding the fish to keep them around. This is necessary when fishing for fast-swimming, wideranging species such as tuna, which may leave a chum slick if they can't find forage.